This talk was presented to the Tasmanian Musicological Society in April 2011. Between 1910 and 1914, which is between Op. 60 and Op. 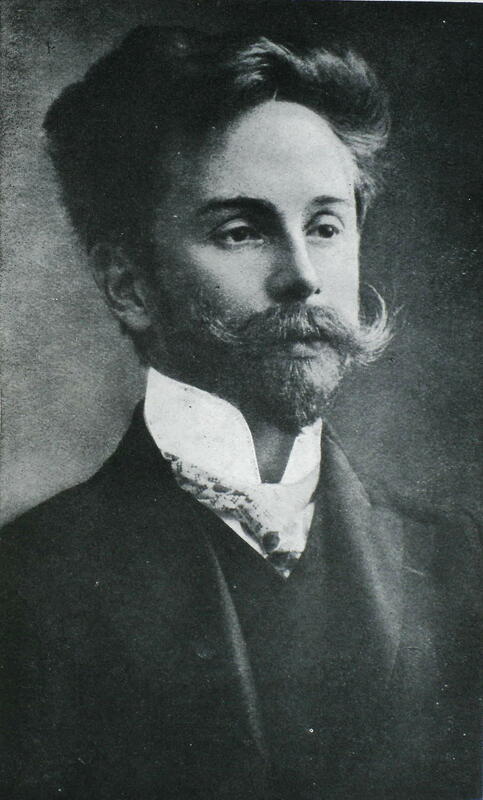 74, Alexander Scriabin went through a big change in his musical language. At the time, there were other composers going through similar changes, but none of them made such a smooth transition as Scriabin did. He left tonal music behind him; and he left behind him the distinction between chord-notes and scale-notes. He started instead with a six-note scale of his own devising, then introduced a seven-note scale, then eight, then nine, and finally a ten-note chord. At every stage, the old scale was contained within the new one, so Scriabin never had to abandon his previous chords. That period contains Prometheus, for piano and orchestra, the last five of his ten piano sonatas, and the rest are short piano pieces. They're all wonderful works, and distinctive, and in a clear language, which is however these days not much taught or analysed. I'd like to start straight away with the chords and scales that Scriabin developed, and then afterwards I'll talk about bits of the context. Over time, there was a tendancy to add notes to the chord, to four or five, or even six notes. The whole-tone chord 222 222 was used already by Debussy and Berg, and the pentatonic was used by Debussy to balance his tenser whole-tone chord. Both these chords have their notes just sufficiently closely spaced that you can also make tunes out of them, use them in other words also as scale-notes. And that's where late Scriabin starts. He liked that idea of having one set of notes which you use for both tune and chord, so the first thing he did was to invent himself a new six-note scale to replace the whole-tone-scale. Smart move; immediately your melodies are more interesting. You can repeat a phrase at different heights, with no loss of variety, because the semitones are in different places every time; but you still get structure from the repetition. but he never used that scale. When you sound all these notes at once, creating a chord, then it does sound a bit harsh, because of the semitone dischord; but Scriabin coped with that simply by spacing the chord better: first of all getting the semitone-dischord notes into different octaves. so Scriabin spaced his chords, rather than restrict the choice of notes to the consonant-notes. And it sounds good; this is fertile ground. With these six-note chords, or scales, he wrote op. 60 (Prometheus) and op. 61. Both of these you can also get by adding one new note to the corresponding type of six-note scale. This meant he didn't have to disown, to avoid his old style: his old six-note scale was contained in his new seven-note one, which guaranteed that he would be able to move freely between them. With these seven-note chords, or scales, he wrote op. 62 and 63.
which you can also derive from seven-note-type-B by adding a note. This scale repeats every two notes, every three semitones, and so it has only three distinct transpositions. Messiaen later adopted this scale. With this scale, he wrote op. 64, 65 and 66.
and then the one 121 121 121 which repeats every three notes, every four semitones, and so has only four distinct transpositions. Messiaen also adopted this one. Scriabin introduced these scales in opus 67, and kept on using them. which repeats every five notes, every six semitones, and so has six different transpositions. Messiaen also adopted this one. Around the same time, Arnold Schoenberg was making a similar journey, but in the process he disowned his previous style, and jumped straight up into the 12-note scale. He also organised it so that every note of the twelve occurred equally often. A problem with the twelve-note-scale is the same old problem as with the whole-tone-scale: it's the same all the way up. At every step the outlook is 111111111111, so it tends to sound like you're going nowhere, because everywhere in the scale looks the same as everywhere else. Meanwhile, Scriabin was making his journey smoothly, retaining his balance at every step, always retaining access to his previous style, and crossing ground that is fertile every step of the way. I'm going to play op. 74 to you, but first I want to say how I know that Scriabin had accomplished the journey he had set out in op. 60 to make. It's because you can see that in op. 59 he knew what he was going to do. Opus 59 is two short pieces for piano. Op. 59 no. 1 is called Poème, and is marked Avec grâce et douceur, and sounds beautiful. Op. 59 no. 2 is called Prélude - now that's already unusual; in two pieces, if one is called Prélude it would usually be the first. But in op. 59, no. 2 is called Prélude; Prelude to what ? It's the prelude to what's about to happen, to op. 60 and beyond. It is marked Sauvage et belliqueux, wild and warlike, and it starts with this descending figure, in the bass, in octaves, on the beat, and it also has these whooshing figures here, in 16ths. Opus 74 no. 5, at the end of this transition, also starts with the descending figure, in the bass, in octaves, on the beat, and it also has these whooshing figures in 16ths. It is marked Fier et belliqueux, proud and warlike. By fier Scriabin means that he's accomplished what he set out to do, and is pleased with it; and by belliqueux he means that he still plans to do more. Indeed, then he set about writing his great masterpiece, the Mysterium. Sadly, he cut himself shaving, developed septicaemia and died, without completing more than the sketch for the first bit. So he found a fertile field but he didn't live to bring in the harvest; he made the journey but he didn't pick up the treasure. But he left us his map. Opus 74 is Five Preludes - not just one, five - preludes to the Mysterium. They go fast-slow-fast-slow-fast (very tried and true), and in form they go binary-ternary-binary-ternary-binary. The chord analysis comes largely from a PhD thesis by Manfred Kelkel, at the Sorbonne, which he published as a book in 1978. I've checked every note; I changed a few of his markings, but really there's almost nothing I can disagree with. The chords are marked there in the third system. This is all on the website so you don't have to memorise it, and there's also a normal score for playing from. This is no. 1; it's marked Douloureux, déchirant, painful, tearing. It uses the ten-note chord, in this context, because of its relatively high discomfort-level. With ten notes, it becomes hard to resolve all the semitone dischords, because you start to run out of octaves to move them to. Finally, op. 74 no 5 brings to a close the whole journey from op. 60. It goes back to the six, seven and eight-note scales, like they were at the start of the journey. Like no. 3, it uses the eight-note chord, 1212 1212, to finish off each section. As we saw in op. 59, it starts with this descending motif in the bass, and has whooshing figures in 16ths. It is marked Fier et belliqueux, proud and warlike. The crucial thing here is not these particular scales, it's the right to use all the scale-notes in a chord. In other words, you can sound them all at once without it sounding unpleasant. You just have to space them well; this mostly means getting the semitone-dischord notes out of the same octave. Scriabin's particular choice of ten or so scales, from six-note to ten-note, is a good example of a well-thought-out system; it covers a lot of ground, and all its parts are connected. I don't think Scriabin's chords commit you to trying to sound like Scriabin. I can imagine some jazz musician adopting these things and making a career out of it, and yet sounding nothing like Scriabin. Plus, you can devise your own scale. You'll probably be able to connect it with Scriabin's scales by omitting one note, or adding one extra. Or, you can devise a whole new set of scales. So, I like his late piano stuff; I think he's on fertile ground here, and I commend him to your attention. To Peter Billam's compositions or the arrangements, or back to www.pjb.com.au . . .